Aloha from the Hilo Earth Day Fair. 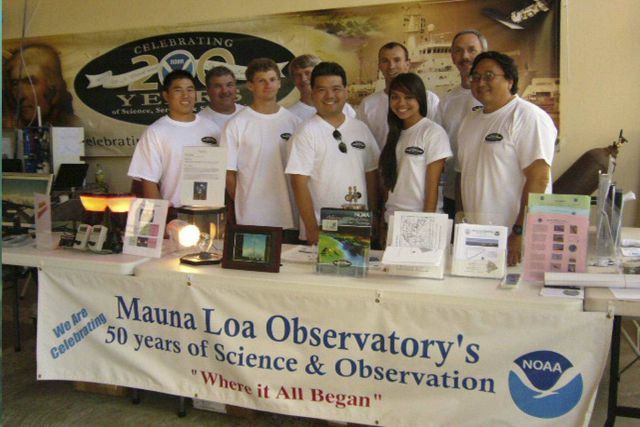 Mauna Loa Observatory (MLO) scientists and staff joined other NOAA organizations to celebrate Earth Day 2007, commemorate NOAA’s 200 years, and also help celebrate MLO’s 50th Anniversary. L-R: Preston Sato, David Nardini, Trevor Kaplan, Director John Barnes, Darryl Kuniyuki, Aidan Colton, Kalei Lau, Steve Ryan, and Paul Fukumura-Sawada.